It is a hard job for a blogger to maintain a community around the blog. It is even more hard to keep the visitors engaged in a communication. Once in a while you write great posts on your blog that attract large user interaction. Some of the users may wish to stay updated with the comments in the post. But to visit again and again to the posts to check the comments might be a tough job. It is the situation where Subscribe to Comments WordPress plugin comes handy. Subscribe to Comments WordPress plugin allow the commentators on your blog to get email notifications for follow-up comments and stay updated with the comments. When you install the Subscribe to Comments WordPress plugin to your blog, it adds a check box below the comment form on each of your published posts. 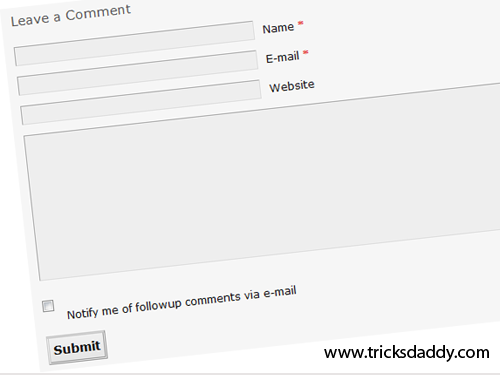 The users who wish to receive the follow-up comments can select the check box and they will start receiving the further comments automatically in the email inbox. If you visit to a post on which you are subscribed to the comments you will see a Manage Subscriptions link instead of the check box. In case you start receiving a lot of notification and you wish to unsubscribe then you can use that Manage Subscriptions link to unsubscribe to the follow-up comments. One of the great features of this plugin is that you don’t need to add any code to your theme. Just install the plugin and it is ready to use. This is one of the must have plugins for your WordPress blog. Next Article We Are On WordPress !!! I will install it first up. Thanks for the info. simran i am searching for this plugin only yaar.. thx now i will install it.. thx once again. I just installed it on my blog today. I had it on a while back, but then took it off. I was not getting much traffic then, but my traffic has increased now so I’m going to see what happens. I also subscribed to your RSS. Hi there – I run a wordpress blog and when I upload images, it’s a total pain to re-size them in the “manage post” section (especially for very large images). I usually end up resizing them and then uploading them. I would prefer to just upload the full size image, but haven’t found an easy to use plugin. Other than the flickr plugins, has anyone had good experience with any wordpress plugins for images? .-= MyDailyBlog.Info´s last blog ..Analisis dan Analisis ! =-. Very nice thing, i have to apply in my blog.